2 per pack + a 1.2 oz. bottle of Doe Tarsal Scent! Hang above or bury in natural or mock scrapes in a container with holes punched in or use to lay a scent trail. 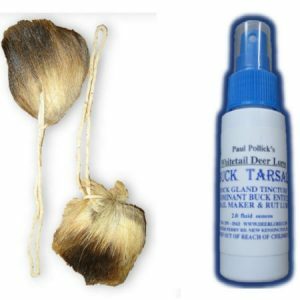 Re-scent with our liquid Doe Tarsal as needed. Handle with rubber gloves. Our tarsal glands have heavy butcher twine attached to create a natural scent drag or to hang in a shooting lane.